As you all know, I was seriously excited to move into our new flat (or “condo” as it’s known out here) and when our shipment arrived from London complete with pots and pans I couldn’t wait to get into the kitchen. Unfortunately, akin to Old Mother Hubbard, my cupboards were bare and so the re-stocking process had to begin. Except it’s not quite the same as back home. All of the things I might normally have picked up as staples are either not available here or are 4 times the price they are in the UK. I know that shouldn’t be too much of a surprise but it still makes things a little tricky. And obviously all I can think of to cook are Ottolenghi recipes (preserved lemons or harrisa paste anyone??) and Italian food. 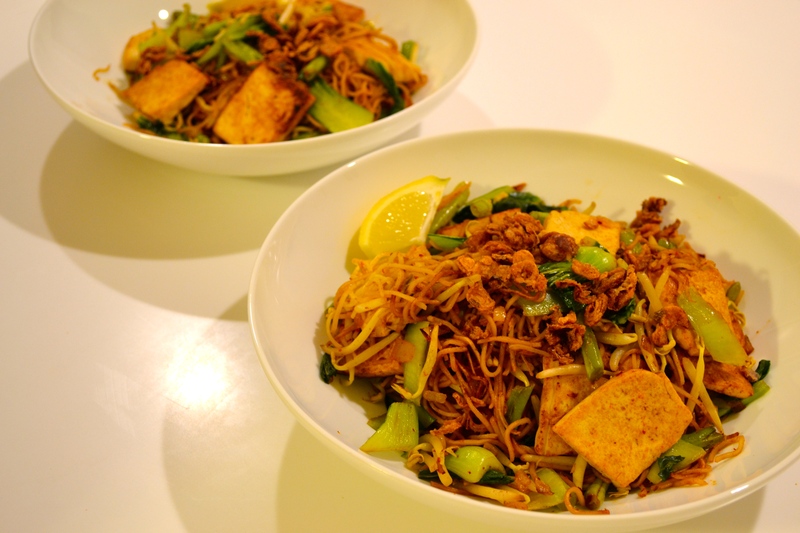 Luckily for me though, the wonderful Ottolenghi has come to my rescue (clearly he heard I was out here…) with a Malaysian recipe for Mee Goreng – all of the ingredients for which are available in abundance. In fact I have never seen so many brands of soy sauce, tofu, noodles, and choi! Tofu hasn’t held much appeal for me previously, however in the spirit of embracing all things Asian I decided to give it a go. With the strong flavours provided by the sauce and as long as you fry it until golden (you need firm tofu not the silken variety), it’s actually not bad. If you’ve got an aversion to the idea though, this would be delicious with chicken or prawns too. 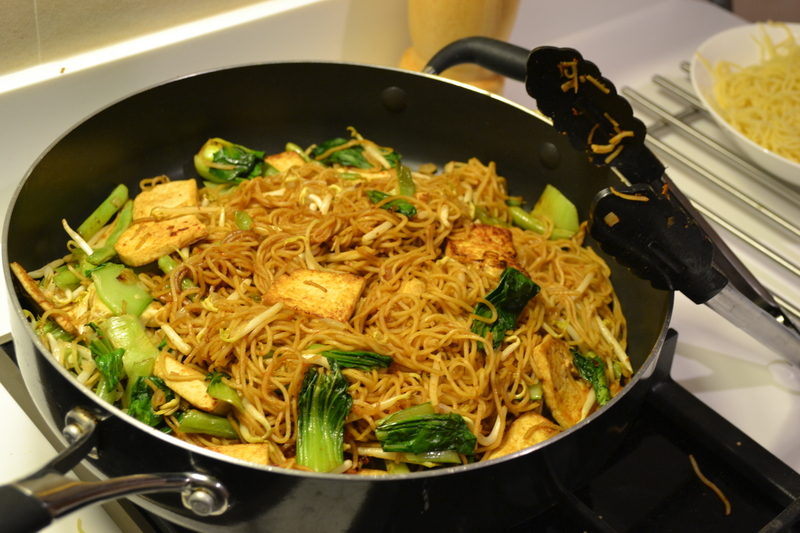 It’s a great mid-week recipe – very quick and easy and, most importantly, delicious. Aside from chopping everything up, the dish took about 8 minutes to get onto our plates – the prep is key though as you don’t have time to faff around once you’ve started cooking! 1. Put a wok or large pan over high heat. Once hot, add the oil, then the onion and cook to soften it for a minute. 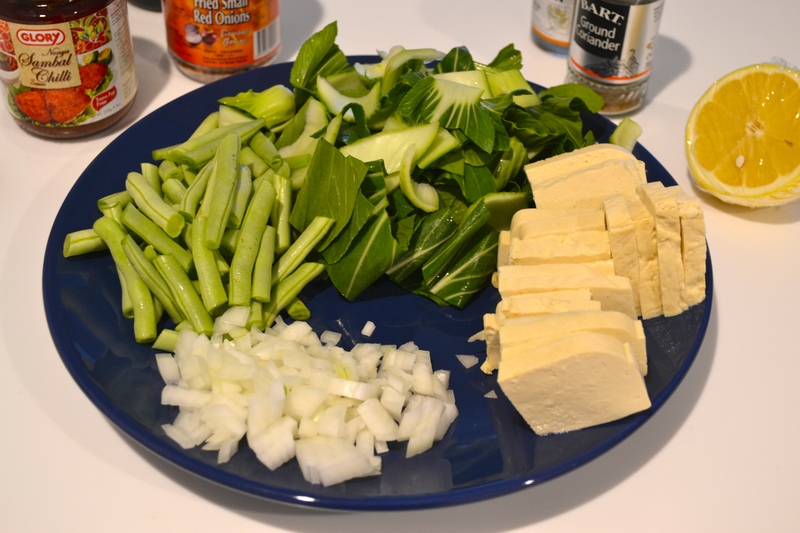 Add the tofu and french beans, and cook to give the tofu a bit of colour – two to three minutes. Stir gently so the tofu doesn’t break up. 2. Add the choi sum and, when it wilts (after about 1 minute), the noodles. Spread them in the wok using tongs or chopsticks – you want them to get a lot of heat, almost to fry. Mix gently, cooking the noodles for about two minutes. 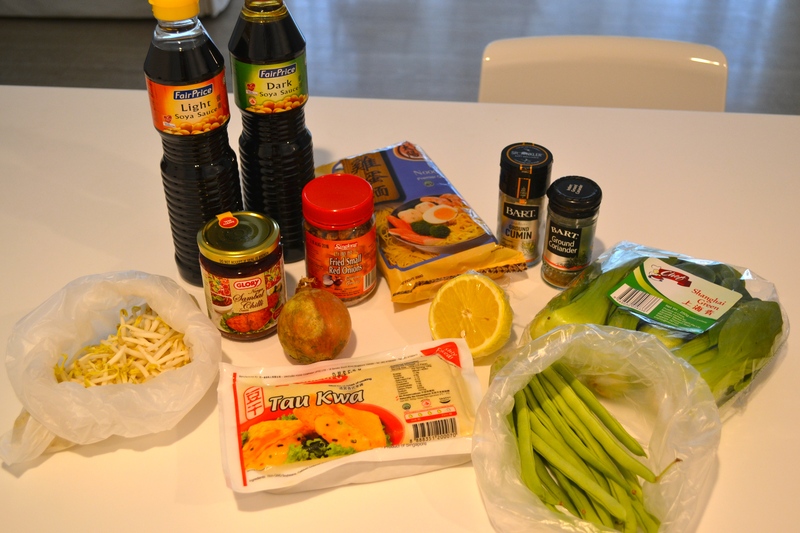 Now add the spices, sambal olek, soy sauce, bean sprouts and a tablespoon of cold water, and toss carefully. Cook for about a minute, or until the noodles are semi-soft. 3. When ready to serve, transfer the noodles into bowls and top with shredded lettuce and crispy shallots. On the side, serve lemon wedges and a small bowl of extra sambal. Eat immediately.